CINCINNATI--By chance, conductor Eun Sun Kim had a week free to lead the season-opening performance of Verdi’s Requiem at the Cincinnati May Festival. Kim stepped in to replace the disgraced James Levine on May 18, squeezing in the Ohio trip between conducting La sonnambula at Frankfurt Opera and making her first recording in Oslo, to include music by violin virtuoso Ole Bull with the Norwegian Radio Orchestra. “I got lucky,” said the 37-year-old, Korean-born conductor with a laugh, shortly after arriving in the Queen City. Actually, Cincinnati got lucky. A commanding presence on the podium, Kim led an inspiring performance of the Requiem, one that communicated both warmth and electrifying power. She was attentive to every detail and accompanied the soloists seamlessly. In addition, she managed to balance the forces of the May Festival Chorus and Cincinnati Symphony Orchestra quite well in the newly renovated Cincinnati Music Hall, where the acoustics are still a work in progress. Until now, Kim has focused an increasingly busy career in Europe, with engagements that include the Berlin State Opera, English National Opera, Vienna Volksoper, Bavarian State Opera, and Royal Opera Stockholm. She began her ascent at Frankfurt Opera, making her debut in 2012 with La bohème. This summer, she’ll add Zurich Opera to her resume in a revival of Carmen. The Cincinnati May Festival, where James Conlon presided as music director for 37 years and which recently appointed Juanjo Mena as its principal conductor, was Kim’s second American appearance. It followed her dramatic North American debut in October leading Houston Grand Opera’s production of La traviata in the wake of Hurricane Harvey. With the company flooded out of its hall, she led a makeshift production in Houston’s George R. Brown Convention Center. Neither she nor the singers could see each other directly, and she had to deal with a delay between the stage and the orchestra, she said. Under the circumstances, the company offered her the option of bowing out. Kim is pleasant, articulate, and speaks six languages, including her mother tongue, Korean. As a child in Seoul, she started playing piano before she was 4. Her mother, who gave piano lessons, noticed that her daughter could play without a score and imitate what she had heard on the radio. She also was endowed with perfect pitch. 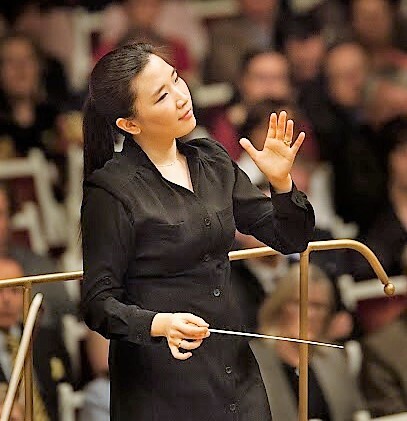 Intending to become a composer, Kim didn’t take up conducting until graduate school, thinking it would be useful for conducting her own compositions. But her professor at Yangsei University, Seung-Han Choi, recognized her natural ability, and encouraged her to study conducting. Kim, who now makes her home in Vienna, Austria, continued her studies at the State University of Music and Performing Arts Stuttgart. Shortly after graduating, she won the International Jesús López-Cobos Opera Conducting Competition in Madrid, which allowed her to serve as the Spanish maestro’s assistant at Teatro Real for two years (2008-10). Observing López-Cobos in action, she said, was invaluable, especially when it came to learning how to get the most out of rehearsal time. Two others have been important to her development. Barenboim, whom she met in 2010, is someone she can call on for advice about a score or a production, although she has not worked formally with him. Kirill Petrenko, chief conductor-designate of the Berlin Philharmonic, is another important mentor. In 2011, she was his assistant for a new production of Tristan und Isolde at Opèra National de Lyon. Although it may appear that she has conducted more opera than symphonic music, Kim remarked that, in reality, she divides her time equally. This season saw her leading the Norwegian Radio Orchestra in Schubert’s Symphony No. 5 and Brahms’s Second Symphony in November. In February, she led Bruckner’s Symphony No. 5 with the Malmö Symphony Orchestra. But being a guest conductor means living with a program for only a short time before moving on to the next orchestra. Her dream job would be to become the chief conductor of an orchestra. That would enable her to spend more time with music that she’d like to program, such as Bruckner, Sibelius, or the French repertoire, and also grow together with an orchestra. Inevitably, Kim finds that she fields questions about the rarity of being a woman on the podium. In Cincinnati, she was the first woman to conduct at the May Festival in its 145-year history.